Chicago Park District parks are the most popular destinations for fun and recreation in Chicago. Whether it's ice-skating, working out at a fitness center, watching an outdoor movie or learning to swim, you can do it all at the Chicago Park District! 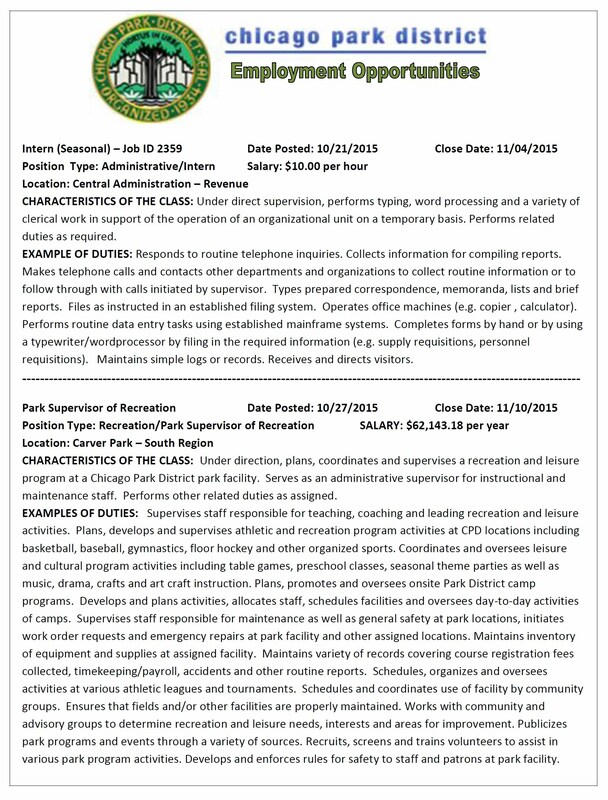 The Job Opportunities page shows the positions currently posted by the Human Resources Department of the Chicago Park District. The positions listed indicate the starting work location. For minimum qualifications and position duties, please see position descriptions. BID denotes an opportunity for Chicago Park District employees who are currently members of the bargaining unit that represents the BID position. An applicant's qualifications for a position will be based on information provided on the employment profile, so please answer all questions as completely as possible. Names of qualified applicants will be placed on a qualified list for consideration for an interview. Being on a qualified list is not an offer or guarantee of interview or employment with the Chicago Park District. A qualified list is merely a statement of eligibility.